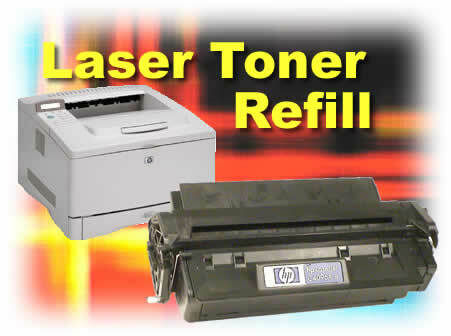 pride in making our “refill-it-yourself” toner refill kits inexpensive, easy to use and reliable. There is almost nothing that can go wrong during the refilling process. In fact, you almost have to intentionally try to make a mistake during the refilling process to have something go wrong – our “refill-it-yourself” toner kits are that easy to use! Other than your cartridge 'pooping out' prematurely (a technical term meaning that the cartridge has reached the end of its useful life – evidenced by dots, spots, splotches, lines or other stray marks on the printed page where they shouldn't be, or voids, hollow characters, white streaks or other areas where the image is missing), there is nothing that can go wrong with our cartridge other than what can go wrong with a name-brand, brand-new cartridge. If and when your cartridge fails to produce the sort of output you are accustomed to, simply do what you normally would do – replace it. But, now that you know about SaveOnCartridgePlus, don't spend big bucks to buy another overpriced name-brand, brand-new cartridge or professionally remanufactured cartridge, simply buy an Refill kits at SaveOnCartridgePlus for the biggest cost savings.